Head Start is a FREE, comprehensive school readiness program which enhances the social, physical, and cognitive development of children. Children’s skills are developed in language and literacy, early math, social and emotional development, nature and science, creative arts, fine and gross motor skills, physical health practices and nutrition. Head Start’s curriculum is evidence-based. Ongoing, age-appropriate assessment is utilized. Students’ progress is tracked, monitored, and shared with parents and other stakeholders. 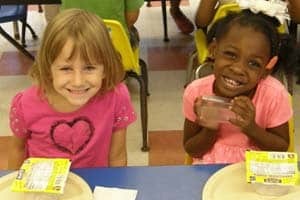 EOC’s Head Start Program is a full-day, full-school-year, holistic early childhood development program for children ages 3-5 from low-income families. Head Start endeavors to improve and promote parent and family engagement to achieve positive outcomes, resulting in children who are healthy and ready to learn. It is recognized that, in order for children to thrive, they must have a healthy, stable home environment. Family engagement is a critical piece of the program. A family assessment, communications between the teacher and parents, and home visits engage parents in their child’s learning and development. Parents are supported in achieving their own goals. They receive training and referrals for community resources. The Head Start Program supports and strengthens parent-child relationships and engages families around children’s learning and development. Parents also volunteer in the classroom, on field trips, and some serve on the Policy Council. Head Start is a Florida VPK (Voluntary Pre-Kindergarten) provider. Parents must obtain a valid VPK certificate. Certificates and additional information are available by contacting the Early Learning Coalition of Indian River, Martin and Okeechobee Counties at (877) 220-1223 or by following the link below. EOC/Head Start has a 50+-year track record of success. All teachers have at least a CDA. Each classroom has at least 1 teacher with an Associate’s or Bachelor’s degree. 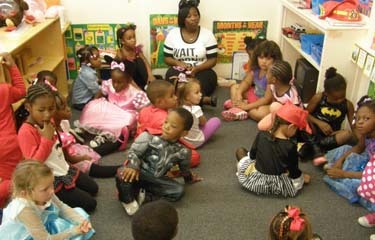 Head Start engages the family in the child’s learning. EOC offers additional resources and programs to help your family succeed. Why is it Important to Give Your Child a Head Start? 29% of County children were not kindergarten ready. 44% County 3rd graders read below grade level. Extended day services are offered to working parents or those continuing their education from 6:30 a.m. until 8:00 a.m. and afternoons from 3:00 p.m. until 6:00 p.m.